The achievements of the Victorian age still appear prodigious from the distance of the 21st Century. This particular ambition still shapes our cities and national institutions. Much of what we know about the Victorians is found in the extraordinary visual documents we now classify as photography, a very particular Victorian legacy that continues to determine our experience of the world. In an extensive display of the British Library’s photographic holdings, the exhibition ‘Points of View’ illustrates that very distinct hunger for innovation and exploration. Initially pioneered by a gentleman amateur William Henry Fox Talbot on his country estate, the medium became by the 1850s a booming industry feeding on the aspirations of a thriving middle class keen to record their growing families and status in photographic studios located in many of Britain’s large towns. From the simplest of images derived from exposed plants on light sensitive paper to sophisticated panoramas, the exhibition carefully lays out the technical development of the medium. It shows too how a fleeting moment could be suspended in time on paper. Many images are so articulate in their accumulation of detail that they feel very contemporary and yet the precise features of buildings, clothing and objects recorded here appear simultaneously strange and distant. These photographs become keystones of historic experience connecting us to a lived past. This enables proximity to such significant events as the Great Exhibition of 1851 or the Great Durbar of 1903. 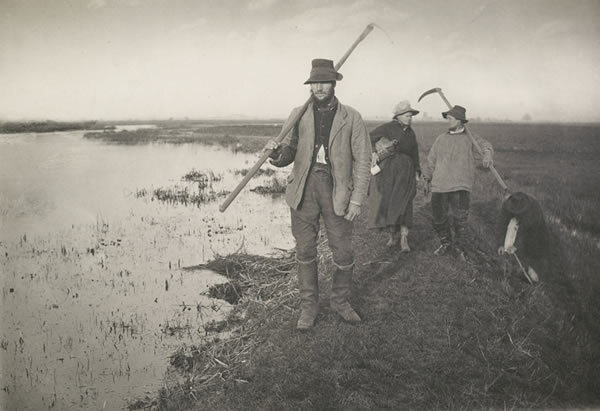 On a more intimate level we may stare in wonder at the farmer carrying a hoe in the Norfolk Broads as if he were a character from a Victorian novel such is the weight of facts: his preoccupied expression, the shape of his hat, the simplicity of his clothes, in fact a whole way of life predicated on living off the land when manual labor was still required to feed the nation. And yet the poise struck by the young man is as knowing as that of a model today affecting to work on the land in order to sell fashion. What each shares is a consciousness of being watched and recorded, that the camera will seize every facet of their physical presence and demeanour. This has become the photographic moment, a very modern consciousness of being watched in perpetuity.